I love backpacking wood stoves. I have built around ten of the quart paint can wood stoves in the last year but have never been happy with their weight and height. 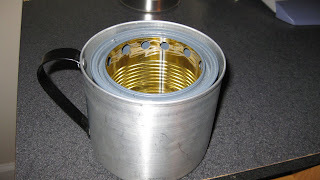 However, since a hammocksforum.net member discovered that the flashing endcaps fit perfectly into the quart can I have been able to finally create one of these stoves to my own specifications. The endcap allows you to chop the quart can down to the height you want. I use an IMUSA four cup mug and wanted a stove that fit inside of it. So I spent about an hour and came up with this. It has a 3.75" tall base compared to the standard 5". It is my new 'go-to' stove, it burns amazingly well and is a lot lighter and more functional than the larger versions. I have had a lot of success with it this far and plan to take it on my future trips. One thing to note, is that I discovered that a stoke tube really helps kick this stove into wood-gas mode really quickly. 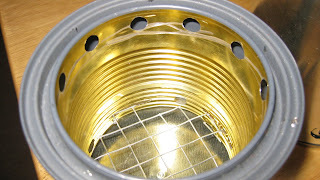 I made it from simple refrigerator water line and a brass coupler. My biggest concern with a wood stove on a backpacking trip is wet wood. 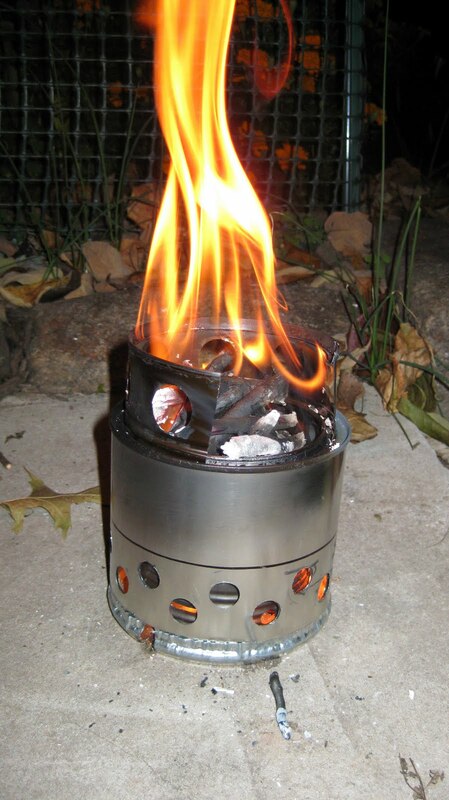 I plan on taking a small alcohol stove along with it on days I don't want to light a fire. However, I was testing one day in a downpour and was very surprised with the results. It started downpouring as I was trying to get it lit. So I ended up trying to start the stove with wet dead fall in a pouring icy rain with a 5-10mph gusting wind, needless to say it was less than optimal. The stove smoked a lot and never really went into gas mode much longer than a couple minutes. After about 25minutes I got annoyed and decided to put it away for a better day, and as I lifted the lid on my pot I realized it was boiling. I don't know how long it had been boiling, but it sure didn't look like the stove was doing anything, it was just into charcoal mode. So it was a nice surprise, one that would work in crappy weather if I give it enough time. 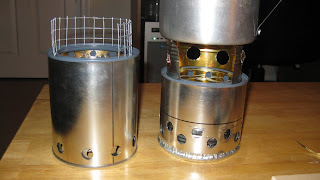 I am going to try to work on a windscreen, I am thinking about trying a windscreen that anchors into the ground with some light stakes instead of actually attaching to the stove. Nice stove. The 3" or 4" aluminium pipe used for dryer vents is great for wind screens. It lays flat when not in use and you can stick more than one piece together.